I woke up this morning with a bit of a chest cold and decided not to blame the Jews for it. Some mystical yearning deep inside my heart”I believe it’s called “common sense””led me to surmise that I am probably not afflicted with the Jew Flu. It’s not that I hold Jews blameless, because they are human beings, too, Shylock, and are therefore not to be trusted. I hold other groups”blacks, feminists, and homosexual sausage-gobbling rump-wranglers”to the same standard. Merely because they find it fashionable to hide behind a shield of historic persecution to further their group interests and seemingly insatiable hunger for power doesn”t mean they are presumed innocent in all situations. I see Jews as human and therefore likely to be up to no good at any given moment. Then again, neither do I blame the Jews for everything. But there is a tiny, bitter, and relentless subset of individuals who tend to do this reflexively. I call them “The Men Who Taste Jews in Their Sandwiches.” They also taste Jews in the soup they slurp and in the apple pie they eat for dessert. Merely by stating this, I”m certain I”ll be accused of being afraid to admit that Jews control the sandwich industry. 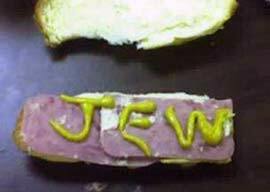 What’s ironic is the fact that although I don”t personally taste Jews in my sandwiches unless I”m eating a Reuben with kosher pickles, I likely ask some of the same questions as do the schmucks who even taste Jews in a slice of Wonder Bread with mayonnaise. I”m drawn to the Jewish Question merely because it’s such an untouchable topic. I realize that the mere act of questioning Jewish power and influence is a career-killer in much of the West, and that in certain countries asking certain questions about the Holocaust is enough to get you jailed. It’s one topic about which most “irreverent” and “non-PC” people are extremely reverent and effusively PC. I”ve also noticed that it’s a topic that many people are eager to talk about off the record but terrified to mention in public. So here’s where I stand on Jews…OK, wait, roll back the tape…I don”t literally stand on Jews, because that would clearly be anti-Semitic. Here are some ancillary questions I have concerning the Jewish Question, and if it makes me anti-Semitic merely to ask them, I suppose I won”t be invited to your son’s Bar Mitzvah. If you want to crucify me merely for asking questions, well, I guess you”re one of The Men Who Tastes Nazis in Your Sandwiches. “¢ Are Jews members of an ethnic tribe or members of a religion? If the latter, how do you explain Jewish atheists? What exactly is a “Semite,” and why does the term “anti-Semitism” seem to embrace people who appear to be of Eastern European derivation while it tends to exclude Arabs and other indigenous Middle Easterners?